A manicule is an indexical device created by or provided to readers to assist in the reading and re-reading of texts. The creator of a manicule can easily locate a passage of interest based on the presence and orientation of a manicule on a page. The manicule can be drawn, printed (fig. 4), or digitally inserted into a text, and it can also facilitate shared as well as individual reading practices (for example, if a book is circulated amongst friends or colleagues). The use of the manicule has permeated so deeply into our culture that, despite being centuries old, its impact and influence is still seen today, perhaps especially so in digital technology. Whereas in the past the manicule lay stationary on the page to indicate interesting passages, today’s mutable digital interfaces offer the opportunity for instant, context-specific transformation.3 Take for example the typical computer cursor: mouse over one area of text, and the cursor appears as an arrow; mouse over a hyperlink and the cursor transforms into a hand with an extended index finger—much like a manicule—pointing towards an area of interest. 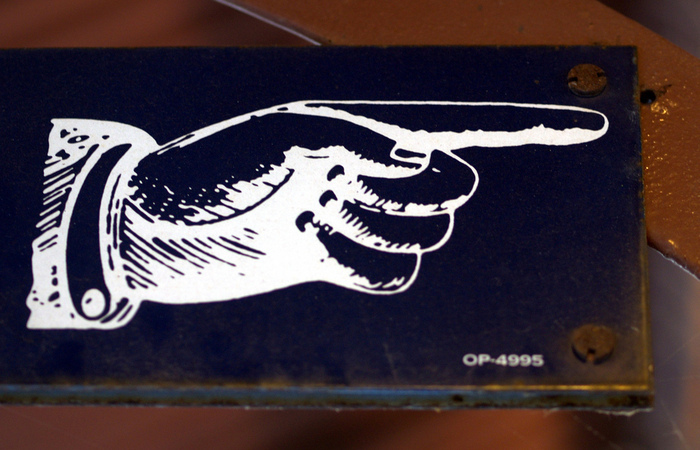 The history of the manicule is very much a history of appropriation. From its earliest uses in manuscript and incunabula to its use in advertising and desktop computing, the manicule has been a persistent, albeit changing, representation of human engagements with cultural textual artifacts. 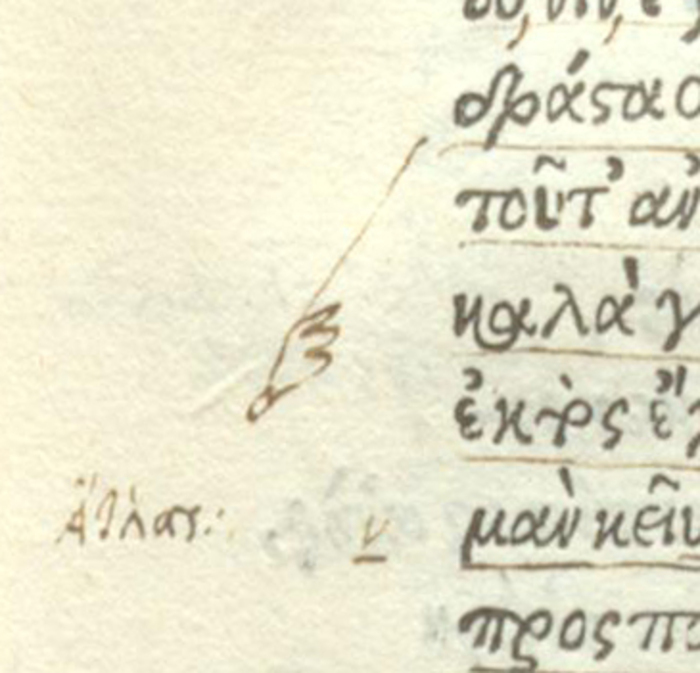 The manicule speaks to the materiality of texts, as well as to our active encounters therein. As demonstrated by a variety of examples, the manicule is simultaneously metaphorical and utilitarian, ephemeral and enduring. The metaphorical and informational value of the human hand is extensive. Throughout history, images of hands and fingers have been variously evoked in religious writing, mnemonics, cryptography, and art. For instance, in the biblical book of Exodus, we encounter the finger as a divine metaphor for the act of writing: “And he gaue vnto Moses, when hee had made an end of communing with him vpon mount Sinai, two tables of Testimonie, tables of stone, written with the finger of God.”4 This image of God’s finger, in the act of writing, and later indicating towards an authoritative text, is analogous to the manicule in manuscript and incunable texts where it persists as a directive that reveals the authority or significance of a particular piece of text. The divine hand appears not only in the text of biblical literature, but also in later pictorial representations in print. In Giambattista della Porta’s De occvltis literarvm notis (fig. 6), the pointing finger of God is depicted at the centre of a cryptographic volvelle Volvelle consists of one or more layers of parchment or paper discs or other segments fastened to a leaf, allowing for each individual layer to be rotated independently of the other components. See the ArchBook essay Volvelles for more details. CLOSE or ESC. 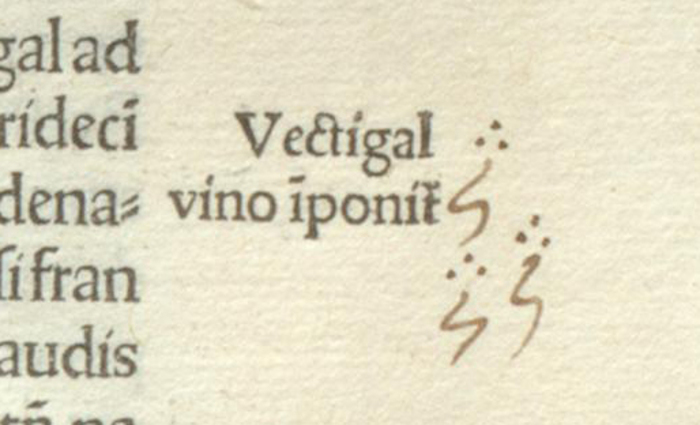 Della Porta’s depiction of God’s hand—a close resemblance to the marginal manicule—elucidates some of the characteristic features of this piece of readerly marginalia. 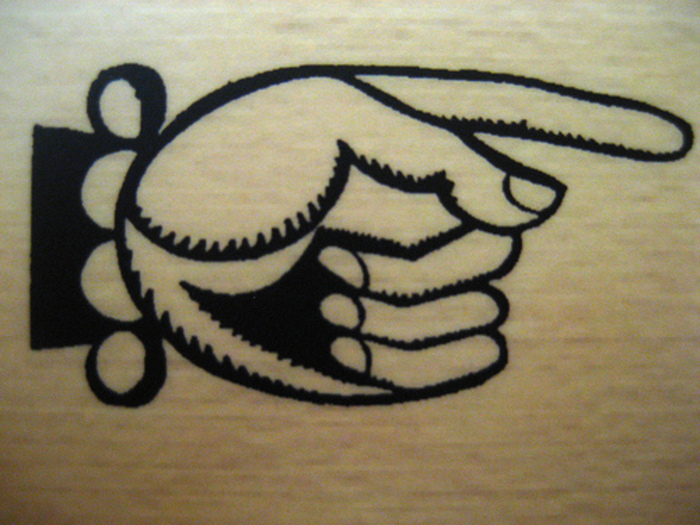 Beyond the authoritative act of pointing, this manicule-like image physically engages in the act of deciphering. Similarly, readerly manicules are often drawn to elucidate and decode a particular element of the text at hand. Printers, particularly in the incunable period, were very much concerned with the replication of manuscript forms and aesthetics. To this end, early printers attempted to replicate rubrication through the use of various woodcuts and inks, and often endeavored to rubricate and illuminate printed texts by hand. The printer’s inclination to replicate manuscript forms extends into the realm of marginal annotation as well. In his Encyclopedia of the Book, G.A. Glaister suggests an editorial function for the printer’s fist: “As with other typographic conventions this was taken from scribal practice, carefully drawn hands pointing to a new paragraph being found in early 12th century (Spanish) manuscripts.”9 In this usage, the printer’s fist performs the same function as a pilcrow (¶), signalling editorial practice in addition to marking specific textual references (fig. 7). The printer’s adoption of the manicule constitutes an expansion of the physical borders of the printed text-block. Increasingly, printers utilized fists not only as decorated pilcrows, but also in conjunction with authoritative commentary to be included as marginal glosses. Printers of the incunable period appropriated not only the manicule as a distinct textual feature but also its coinciding marginal notes, and the evolving interplay between the text-block and surrounding blank space. Effectively, they mimicked both manuscript aesthetics as well as current reading practices. 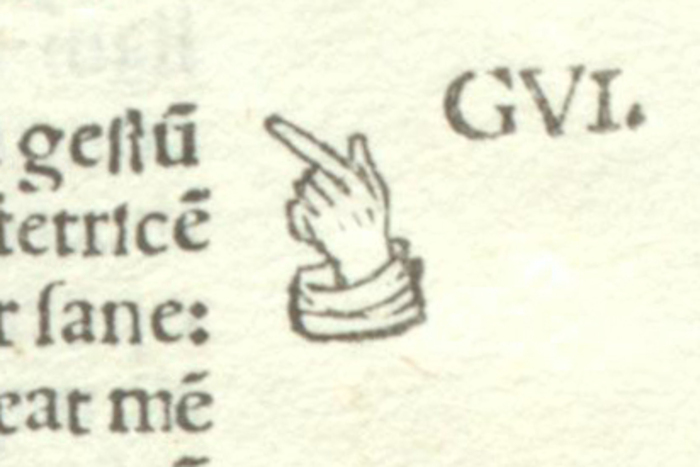 Early printers incorporated the manicule into their type-cases; however, it seems they also incorporated it into their unique professional colloquialisms as well. In particular, the term “mutton space” may originate in the terminology for units of measurement commonly used in printing shops. In typography, the spacing between letters is often designated as either an “en-” or “em-space,” named after the "N" and "M" sorts which are of the same width.10 Printer’s colloquialisms for these spacing units included “nut-space” and “mutton-space” so as to avoid miscommunication amidst the noise of the printing shop. These colloquialisms, then, suggest that Sherman is correct in identifying and attempting to preserve the historical terms associated with the manicule, specifically “mutton fist”: “even if we can no longer imagine what a pointing hand has to do with […] sheep.”11 The term “mutton fist” may indeed reveal more about the printer’s appropriation of the manicule than is currently known. In the nineteenth and twentieth centuries, manicules entered a new stage in its lengthy history of appropriation and adaptation. At this time, the manicule became adapted for use by a burgeoning advertising industry, coming to play, as Sherman notes, “a crucial role in the visual vocabulary of advertising.”12 As in manuscript culture, early printing conventions, and Renaissance reading practices previously, the manicules featured on signposts and post bills were intended to direct their reader. 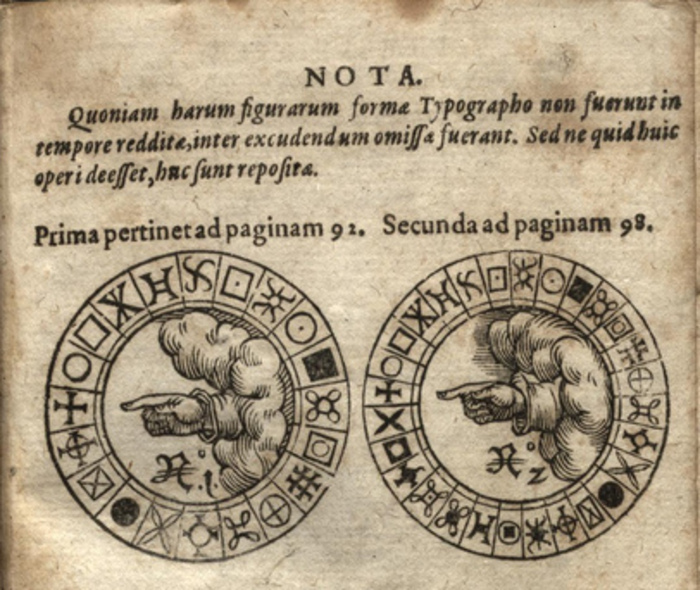 These manicules did not direct towards texts, but rather, towards places and events. Rather than being presented as a complement to text, the manicule increasingly came to be used in lieu of text. It had effectively become the text (fig. 8). The manicule, as a visual symbol, has also persisted into modern digital environments, most notably in personal computing and on the World Wide Web. Peter Stallybrass considers the evolution of reading practices and textual navigation in a book chapter titled “Books and Scrolls: Navigating the Bible,” where he writes, “The navigation of computers is still imagined in the visual language that was elaborated in the fifteenth century for the navigation of books: the language of the index finger and of its prosthetic form, the bookmark.”13 In this modern context, the manicule acts simultaneously as an interface between the reader and the textual-visual environment of the screen, as well as a text in and of itself. Particularly in hypertext environments, the digital manicule reveals interactive objects, or gateways into new texts. As a result, the manicule replaces directive text in a similar fashion to the manicules found on nineteenth- and twentieth-century signposts. 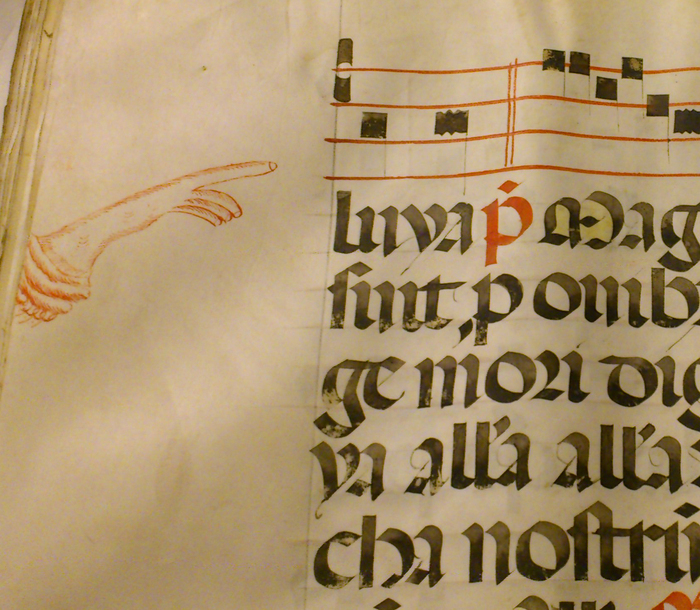 However, this is not to say that the manicule has somehow become divorced from its earliest forms and usages. The underlying mechanics of the scribal and early print manicule are present in their digital counterparts. The directive and indexical functions of the manicule have persisted to some degree. When scrolling through a page of hypertext links we are confronted by structural and aesthetic systems of information organization and retrieval that are not far removed from the acts of using one’s finger to flip through the pages of a book, or of skimming an index by moving one’s finger from one entry to another. It may be surprising for some to find the manicule—a textual feature rooted in manuscript and early print culture—acting as a ubiquitous interface between human and computer. Peter Stallybrass seems to echo this feeling of surprise when he writes; “Yet my Macintosh computer still uses a little hand to travel around the screen and a pointing finger.”14 However, the adaptation of the manicule in digital environments is not anachronistic. The manicule speaks to broader, more universal ways of understanding, creating, and physically interfacing with textual artefacts. However, it is also important to recognize the symbolic and informational value of certain interface elements that have been adopted from Renaissance reading habits. Tabs, manicules, and bookmarks are all elements that have been appropriated from the rich history of the book for use within current graphical user interfaces. Despite this general trend, the potential usefulness of the manicule has not been fully explored within today's digital reading environment: As Martyn Jessop notes, “Graphic aids to thinking are not new, but the emergence of digital technology has created a new medium for these tools that provides extended functionality and many new opportunities for development.”17 Although interface design, both in its past and in its present manifestations, has certainly looked to print and manuscript culture for inspiration, it has stopped short of exploring how new technologies create new conditions for the material aspects of texts. As we have mentioned earlier, manicules persist in digital environments as computer cursors. Manicules have also caught the interest of designers of digital reading environments and are slowly becoming incorporated into digital reading practice. The best example of this return to the manicule’s original function is presented within iAnnotate, an iPad application created by Aji LLC. iAnnotate is a PDF PDF stands for Portable Document Format, an open file format developed by Adobe which is independent of the parent program. There are a range of programs available to open these documents some of which are also open source (JISC Digital Media Glossary). See: Page Display Type Layout CLOSE or ESC viewer application for the Apple iPad. Amongst its major features is a complete annotation system, including the ability to add stylized manicules to PDF documents. These manicules (fig. 9) may be dropped onto the page, moved around, and resized.18 Their symbolic value within this modern interface remains undiluted from its Renaissance origins. In fact, the manicule takes on even greater symbolic value when we consider the mode of interaction that is presented by touch interfaces. The reader’s fingers are once again the point of contact between the reader and the text. Because touch interfaces eliminate the mediating layer occupied by keyboards, computer mice, and other input devices, the reader’s body, specifically their fingers, are once again in direct contact with the text as the reader points, gestures, and leaves marks on the text. iAnnotate represents but an initial attempt at appropriating and extending the functionality of a very old textual feature. We might approach the iAnnotate manicule as a type of modelling experiment, where the functionality and features of this style of interaction are still being fleshed out. For instance, though it is resizable, and orientable in the sense that it can be moved continuously around its axis, the manicule cannot be mirrored so as to point towards the left. Despite this lack of functionality, iAnnotate has demonstrated the value of looking at textual objects and their histories of interaction. Particularly within touch interfaces, attention to these types of interactions promises to extend our understanding of textual environments and what we really do in them. Touch interfaces constitute environments where we may both replicate and extend the rich history of textual interaction that has been preserved and documented by the bibliographic field. The manicule in particular, as a highly flexible textual feature, has the power to illuminate our understanding of textual interaction and of the ways in which human cognitive and tactile faculties coalesce in the act of reading. 1 Raymond Clemens and Timothy Graham, Introduction to Manuscript Studies (Ithaca and London: Cornell University Press, 2007), 44-45; William H. Sherman, Used Books: Marking Readers in Renaissance England (Philadelphia: University of Pennsylvania Press, 2008), 33-34. 2 Sherman, Used Books, 29. 3 Ibid., 40. 4 Exod. 31:18, King James Bible. 5 Mary Carruthers, The Book of Memory, 2nd ed. (Cambridge: Cambridge University Press, 2008), 195. 6 Mary Carruthers and Jan Ziolkowski, The Medieval Craft of Memory (Philadelphia: University of Pennsylvania Press, 2002), 75-76. 7 Claire Richter Sherman, Writing on Hands: Memory and Knowledge in Early Modern Europe (Washington, DC: The Folger Shakespeare Library, 2000). 8 Sherman, Used Books, 35, 208. 9 G.A. Glaister, Encyclopedia of the Book (London: Oak Knoll Press, 2011). Qtd in Sherman, Used Books, 32-33. 10 David Greetham, Textual Scholarship: An Introduction (New York: Garland, 1994), 114. 11 Sherman, Used Books, 34. 12 Ibid., 39. 13 Peter Stallybrass, "Books and Scrolls: Navigating the Bible," in Books and Readers in Early Modern England: Material Studies, ed. Jennifer Andersen and Elizabeth Sauer (Philadelphia: University of Pennsylvania Press, 2002), 46; see also Peter Stallybrass, "The Book as Computer" (Lecture for the Digital Humanities Speaker's Series Future Knowledge: Prospects for a Digital Era, University of South Carolina, April 17, 2009. Available at https://sc.edu/about/centers/digital_humanities/future_knowledge_archive/stallybrass_videopage.php.). 14 Ibid. 15 Sherman, Used Books, 179. 16 Lisa Jardine, "Page-turning passion" (BBC, January 8, 2010. http://news.bbc.co.uk/2/hi/uk_news/magazine/8447996.stm). 17 Martyn Jessop. "Digital Visualization as a Scholarly Activity," Literary and Linguistic Computing 23, no. 3 (2008): 281-293, 281, emphasis added. 18 Aji LLC. http://www.ajidev.com/iannotate/. Carruthers, Mary, and Jan Ziolkowski. The Medieval Craft of Memory. Philadelphia: University of Pennsylvania Press, 2002. Carruthers, Mary. The Book of Memory. 2nd ed. Cambridge: Cambridge University Press, 2008. Glaister, G.A. Encyclopedia of the Book. London: Oak Knoll Press, 2001. Jardine, Lisa. "Page-turning passion." BBC, January 8, 2010. http://news.bbc.co.uk/2/hi/uk_news/magazine/8447996.stm. Sherman, Claire Richter. Writing on Hands: Memory and Knowledge in Early Modern Europe. Washington, DC: The Folger Shakespeare Library, 2000. Stallybrass, Peter. "Books and Scrolls: Navigating the Bible," in Books and Readers in Early Modern England: Material Studies. Edited by Jennifer Andersen and Elizabeth Sauer. Afterword by Stephen Orgel. Philadelphia: University of Pennsylvania Press, 2002. Stallybrass, Peter. "The Book as Computer." Lecture for the Digital Humanities Speaker's Series Future Knowledge: Prospects for a Digital Era, University of South Carolina, April 17, 2009. Available at https://sc.edu/about/centers/digital_humanities/future_knowledge_archive/stallybrass_videopage.php.